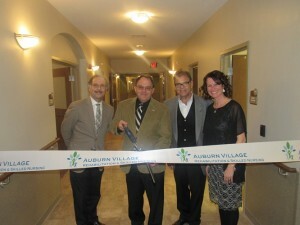 Auburn Village recently celebrated the expansion and renovation of its facility in Auburn, IN with a grand reopening ceremony. Guests, healthcare professionals and friends were invited to tour the newly renovated and expanded facility that offers a new short-term rehabilitation unit and amenities throughout the campus. Auburn Village has 75 private rooms for guests to rest and relax when not in the therapy gym. Rooms have electric beds, flat screen TVs, brand new private bathrooms with showers and more. The renovation and expansion also includes a new reception area and lobby with fireplace, internet lounge, sports bar, movie theater, library, three dining rooms including a private dining space for special occasions, ice cream parlor and private courtyards. The state-of-the-art therapy gym is open 7 days a week and supervised by occupational and physical therapists providing therapy that is individualized and intensive designed to restore strength, enhance balance skills, promote independence in activities of daily living and improve physical and cognitive functions. Auburn Village has a rich history of providing quality healthcare throughout the northeast Indiana region. The Auburn Village family is proud to offer our residents compassionate person-centered care, quality-of-life activities and concierge-level service. Call today, 260.925.5494 to learn more about our rehab therapy, private suites and more.